Footnotes: *Based on population just within the county. Delaware County is a county in the U.S. state of Ohio. As of the 2010 census, the population was 174,214. Its county seat is Delaware, Ohio. The county was formed in 1808 from Franklin County, Ohio. Both the county and its seat are named after the Delaware Indian tribe. Delaware County is included in the Columbus, Ohio Metropolitan Area. U. S. President Rutherford B. Hayes was born and raised in Delaware County. It is also home to the Columbus Zoo and Aquarium. 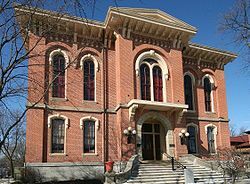 In 2008, Forbes magazine ranks Delaware County as the fifth best place in the United States to raise a family and the second best in Ohio, behind Geauga County. According to the U.S. Census Bureau, the county has a total area of 457 square miles (1,180 km2), of which 443 square miles (1,150 km2) is land and 14 square miles (36 km2) (3.1%) is water. The county has an even terrain and a fertile soil. The major rivers of the county are the Scioto River, Olentangy River, Alum Creek, and the Big Walnut Creek. These waterways run from north to south across the county. The Alum Creek Lake and the Delaware Lake are reservoirs created on Alum Creek and the Olentangy River, respectively. As of the census of 2000, there were 109,989 people, 39,674 households, and 30,668 families residing in the county. The population density is 249 people per square mile (96/km²). There were 42,374 housing units at an average density of 96 per square mile (37/km²). The racial makeup of the county was 94.25% White, 2.52% Black or African American, 0.14% Native American, 1.54% Asian, 0.03% Pacific Islander, 0.38% from other races, and 1.14% from two or more races. Hispanic or Latino of any race were 1.01% of the population. 26.8% were of German, 11.7% Irish, 11.3% English, 10.7% American and 6.9% Italian ancestry according to 2000 census. There were 39,674 households out of which 40.10% had children under the age of 18 living with them, 67.70% were married couples living together, 6.70% had a female householder with no husband present, and 22.70% were non-families. 18.10% of all households were made up of individuals and 5.30% had someone living alone who was 65 years of age or older. The average household size was 2.70 and the average family size was 3.09. In the county, the population was spread out with 28.20% under the age of 18, 7.60% from 18 to 24, 32.60% from 25 to 44, 23.30% from 45 to 64, and 8.20% who were 65 years of age or older. The median age was 35 years. For every 100 females there were 98.00 males. For every 100 females age 18 and over, there were 94.90 males. The median income for a household in the county was $67,258, and the median income for a family was $76,453. Males had a median income of $51,428 versus $33,041 for females. The per capita income for the county was $31,600. About 2.90% of families and 3.80% of the population were below the poverty line, including 4.40% of those under the age of 18 and 4.80% of those 65 and older. By 2007, the median income for a household and for a family had risen to $80,526 and $94,099 respectively. According to the United States Census Bureau, Delaware County is the 21st fastest growing county in the United States. As of the 2010 United States Census, there were 174,214 people, 62,760 households, and 47,977 families residing in the county. The population density was 393.2 inhabitants per square mile (151.8/km2). There were 66,378 housing units at an average density of 149.8 per square mile (57.8/km2). The racial makeup of the county was 89.7% white, 4.3% Asian, 3.4% black or African American, 0.1% American Indian, 0.6% from other races, and 1.8% from two or more races. Those of Hispanic or Latino origin made up 2.1% of the population. In terms of ancestry, 34.2% were German, 16.3% were Irish, 14.0% were English, 8.1% were Italian, and 5.7% were American. Of the 62,760 households, 41.9% had children under the age of 18 living with them, 65.8% were married couples living together, 7.3% had a female householder with no husband present, 23.6% were non-families, and 19.0% of all households were made up of individuals. The average household size was 2.74 and the average family size was 3.16. The median age was 37.4 years. The median income for a household in the county was $87,908 and the median income for a family was $101,698. Males had a median income of $70,949 versus $48,913 for females. The per capita income for the county was $40,682. About 3.4% of families and 4.6% of the population were below the poverty line, including 4.8% of those under age 18 and 5.4% of those age 65 or over. Delaware County is a Republican Party stronghold. The solitary Democratic Party candidate to win the county from 1872 to the present day was Woodrow Wilson in his 1912 & 1916 electoral victories. The following school districts are located in Delaware County. The Ohio Wesleyan University, located in Delaware, Ohio, is one of the top liberal arts colleges in the United States and one of the Five Colleges of Ohio. The area is served by the Delaware Municipal Airport, which is strategically located to serve the rapidly developing southern Delaware County area and the north portion of the Franklin County and Columbus areas. The airport contains a 5,000 foot runway, flight terminal, lounges, and weather briefing areas. It is home to approximately 80 aircraft and an estimated 40,000 operations take place per year. Several smaller airports are located in the county. The Delaware Gazette, a morning daily founded in 1885, is the dominant local newspaper in Delaware County, while the Sunbury News, a weekly community newspaper, serves eastern Delaware County and residents of the Big Walnut Local School District. Both publications are owned by Brown Publishing Company. Other local publications include the Transcript, the student paper at Ohio Wesleyan University. Delaware, Ohio is famous for The Little Brown Jug, an internationally famous harness race which is part of the Triple Crown of harness racing. The Methodist Theological School in Ohio is the Methodist graduate school seminary located between Delaware and Columbus, Ohio. It is often referred to as METHESCO. Alum Creek State Park and the Delaware State Park bring millions of local, national, and international visitors to the area each year. Historical Marker of Rutherford B. Hayes' home on E. William St. Notable natives include Rutherford B. Hayes, who was the 19th President of the United States (1877–1881). His wife, Lucy Webb Hayes, was one of the most popular of first ladies. She strongly supported the Temperance movement, and no alcohol was served in the White House during the Hayes administration. This prompted the press to call her "Lemonade Lucy." She also brought the annual Easter egg roll to the White House lawn. ^ "Ohio County Profiles: Delaware County" (PDF). Ohio Department of Development. Retrieved 2014-05-11. ^ a b "State & County QuickFacts". United States Census Bureau. Archived from the original on July 9, 2011. Retrieved February 7, 2015. ^ "Delaware County". Ohio History Central. Ohio Historical Society. Retrieved 2014-05-11. ^ "America's Best Places To Raise A Family". Forbes. June 30, 2008. ^ Ripley, George; Dana, Charles A., eds. (1879). "Delaware, the name of five counties in the United States. III. A central county of Ohio" . The American Cyclopædia. ^ a b "Alum Creek State Park". Archived from the original on 2007-06-30. Retrieved 2007-09-12. ^ a b "Delaware State Park". Retrieved 2014-05-11. ^ Chinni, Dante; Davis, Bob (20 July 2016). "Donald Trump Divides Republicans in Key Ohio County". Wall Street Journal. Retrieved 22 July 2016. ^ a b "Delaware Airport". Archived from the original on 2007-08-26. Retrieved 2007-09-12. ^ "End of the Road for Germain Amphitheater?". Archived from the original on 2011-05-23. Retrieved 2008-05-19. ^ "News & Media - Ohio Wesleyan University". Ohio Wesleyan University. ^ "Delaware Ohio Landmark Adds Hours". delawareohrealestate.com. 5 September 2010. ^ "Home". The Strand Theatre. ^ "Library of Congress Online Catalog". Retrieved 2007-09-12. This page was last edited on 10 March 2019, at 06:18 (UTC).